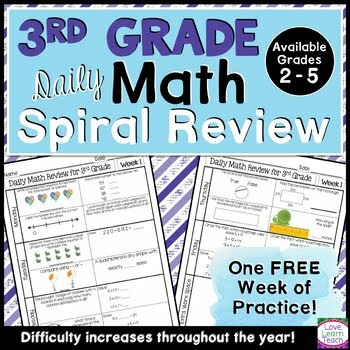 This resource can easily be used as spiral math morning work, daily math review, math warm-ups, or even homework! This spiral math review has been designed to help keep math concepts fresh all year, and it saves you time by simplifying your morning work routine. The level of difficulty increases throughout the year. This resource samples the 3rd grade version of Morning Work Spiral Math Review. To purchase a FULL YEAR of 3rd grade spiral review with answer keys, click HERE. PLEASE ask all questions BEFORE you purchase. CLICK the STAR to FOLLOW my store to find out about new products, which will be 50% OFF the FIRST 48 HOURS they are available! Please leave feedback. I would love to hear how you used this product in your classroom, and you earn TpT credit for feedback left on paid items.